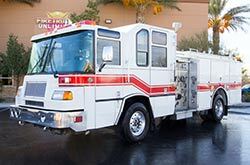 Pahrump Valley Fire and Rescue Services were granted funding to purchase an engine pumper apparatus to replace the one that suffered “catastrophic mechanical failure” late last month. The pumper is 19 years old and has responded to 3,364 service calls in 5 years, deeming it no longer cost effective to repair and maintain. Fire Chief Scott Lewis told the Pahrump Town Board that to purchase a new, similar apparatus, would cost approximately $450,000 to $500,000. As a cost savings measure, the chief offered up an alternative by suggesting the town acquire a refurbished pumper at less than half of the cost of a new one. Additionally, the refurbishing facility, Firetrucks Unlimited, is located in Southern Nevada. “We had gone out and sought ideas and options as far as replacing that particular piece, which brought us to a refurbishing manufacturer in Henderson. They solely deal with pumpers, airport rescue and large scale rescue and their main purpose is to refurbish these types of equipment. 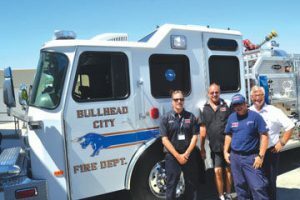 The Town of Pahrump has conducted business with Fire Trucks Unlimited over the past decade. They have certified technicians trained to perform refurbishments and they have a solid reputation,” he said. In years past, the town has acquired various firetrucks from other parts of the country. Lewis said the fact that the pumper truck was designed for Southern Nevada’s climate makes the acquisition that much more attractive. “Fortunately for us, they recently acquired several pieces of equipment that would meet our needs and one of the key factors that we considered in this was the fact that these apparatus were designed for desert use and are used by all of the major players located in Clark County. There would be some changes made to these apparatus that would allow us to meet our operational objectives in the nature of our responses that we encounter here in Pahrump,” he said. Lewis also provided the board with two options, the first he considered “high risk” was to continue to repair the out-of-service pumper until it is deemed unsafe and irreparable. The second, “low risk” option would be the purchase of the refurbished pumper using three older pieces as trade-ins at a cost not to exceed $150,000. Lewis said the actual turnaround time with the low risk option would also benefit the town. “We don’t have to go through the design phase on building the apparatus from the ground up because it’s more in line with our operational objectives. We fully anticipate that it will have a 90-day turnaround time, which would be to our advantage as we are down a full-sized piece of apparatus,” he said. The fire chief also issued a caveat to board and staff regarding other aging vehicles in the fleet. “Our pumpers are the workhorses and go on the most calls. Our engines, Two and Four, which are our newest engines are now 10 years old this year. Within the next four to five years, they will also be in alignment for refurbishing. We are operating apparatus that range from 10 years old up to 28 years old and those apparatus no longer meet the intent of the National Fire Protection Association compliance on our firefighter’s safety as well as the maintenance,” he said. Following further discussion board members voted unanimously to approve funding for a refurbished pumper truck at a cost not to exceed $150,000.